EPC “Ingehim” (EPC “Inzhekhim”, as in some older unofficial documents and affiliations in scientific publications of our employees) offers receiver tanks and blocks of receiver tanks. 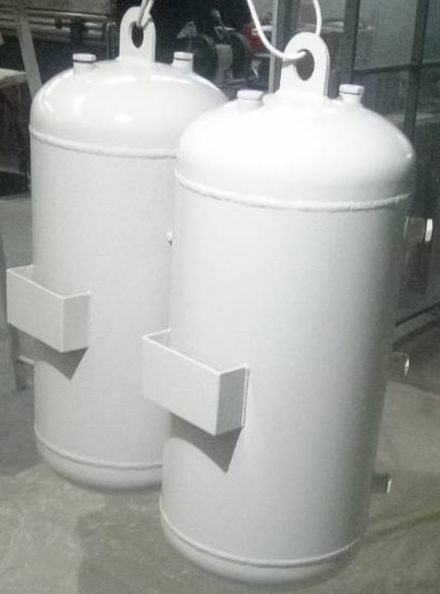 Receiver tanks are intended to store compressed air, mitigate pulsations caused by operation of the compressor and reduce the number of startups/shutdowns of the compressor. Receiver tanks increase the service life of the compressor, stabilize the pressure in the pneumatic system or pipelines, cool the compressed air initially, collect and remove condensate. The receiver tanks can be used at the facilities of chemical, petrochemical, oil and gas refining, oil-gas and other industries. Blocks of receiver tanks consist of two or more receiver tanks connected by pipeline fittings and installed on a common frame or base. Both in-parallel connection and in-series connection of the receiver tanks is possible. Declarations of Conformity with the Technical Regulations of the Customs Union were granted to our receiver tanks and blocks of receiver tanks. To order receiver tanks and blocks of receiver tanks, please, provide us with all requirement specifications through e-mail.